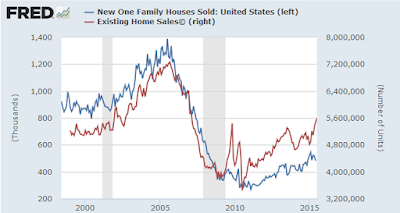 Contra Corner » Strong Home Sales? Price Mismatch? 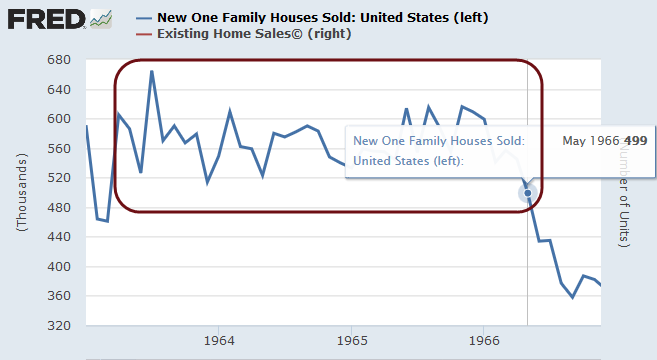 Strong Home Sales? Price Mismatch? Economists are bubbly over home sales, especially existing home sales that came in at the top end of the Bloomberg Consensus range of 5.3 to 5.6 million homes at a seasonally adjusted annualized rate. There's plenty of life in the housing sector with existing home sales up a stronger-than-expected 2.0 percent in July to a 5.59 million annual rate. And demand is well ahead of supply which is very thin, at 4.8 months at the current sales rate vs 4.9 and 5.1 in the two prior months and 5.6 months in July last year. Sales are up 10.3 percent year-on-year, well ahead of the median price which, at $234,000, is up 5.6 percent. This mismatch, especially with thin supply, hints at pricing power ahead. Single-family homes lead the report, up 2.7 percent in the month at a 4.960 million annual rate. Condos, where demand on the new home side is soaring, actually fell 3.1 percent in the month to a 630,000 rate. Year-on-year, sales of single-family homes are up 11.0 percent with condos at plus 5.0 percent. By region, July's strength is centered in the South with a gain of 4.1 percent. The West follows at plus 3.2 percent with the Midwest unchanged and the Northeast down 2.8 percent. Year-on-year, sales are very evenly balanced with all right at the 10 percent mark. The balance of this report is impressive, pointing to a rising tide of strength across housing which, given spotty performances by the factory and consumer sectors, looks to be the leading driver for the second-half economy. Existing home sales are now back to a level first seen in 2001. 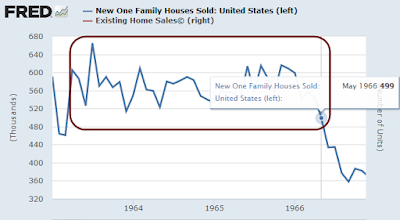 New home sales are below a number reached in 1963. Sales are "strong" only as compared to recent anemic activity. New home sales currently sit at 482,000 (seasonally adjusted annualized). Every month between April 1963 to May 1966, inclusive, exceeded the current total. 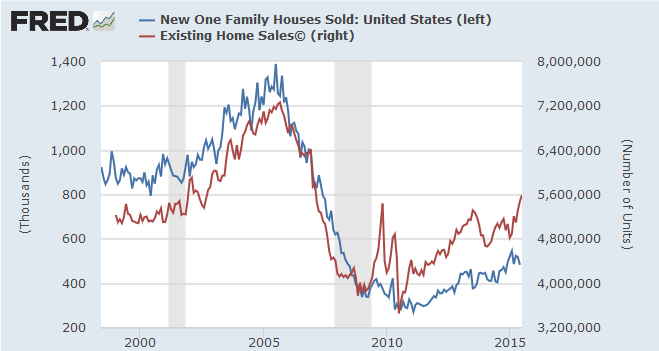 New home sales are far more important than existing home sales. 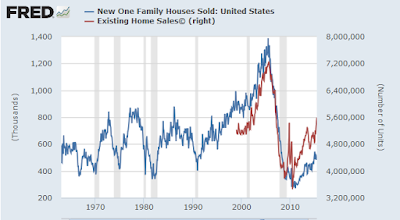 People remodel a bit on existing home sales. Typically they paint, perhaps buy a new appliance, or plant a tree. Some even put in new cabinets. Others may have to repair a roof. But some do nothing at all. On a new home, everything is new from appliances to shingles. Landscaping follows. So does furniture. Few new jobs are created on existing home sales. Multiple jobs are involved in new home sales. Finally, existing home sales are recorded at closing. New home sales are recorded at contract time, with jobs activity guaranteed to follow. Bloomberg states "Sales are up 10.3 percent year-on-year, well ahead of the median price which, at $234,000, is up 5.6 percent. This mismatch, especially with thin supply, hints at pricing power ahead." Is that what it means, or does it mean buyers cannot afford much because everyone who could afford more already bought?